Bay Leaves come from the Bay Tree (laurel) which is native to the Mediterranean area. Required for great soups and stews they're widely used in French and Italian cooking. Packed in flavor sealed PET plastic bulk container. 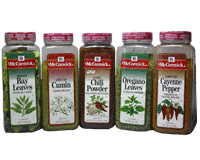 Save more when you buy this product as part of a collection: McCormick Chili Makers Collection. Coquille St Jacques More Recipes..